One of my favourite venues to take in a bit of art ingestion after work has to be Art Sawa. The next artist to showcase his talent there will be Robert Hammond with his ‘Flower Power’ exhibition. Robert studied Fine Art at St. Martins and WSCAD in the UK. His early works are painterly compositions in the neo-expressionist tradition. Robert’s latest works bring-forth new materials coupled with a new aesthetic, entitled visual ritual. In his wall sculptures, large cartoon faces and figures, outlined by thick curved metal profiles – contain montage imagery behind polished glass surfaces. At first whimsical and cute – on second look you are peering through these figures into pulsating montages of dripping paint, concentric line patterns and smeared chalk. At play is a marriage of optical patterns, corrugated space and unfocused images. It is in the playful mastery of lines where the power of his art lies. His works are essentially metal line drawings, extruded into the 3rd dimension – at times concentric, converging and diverging, at times kaleidoscopic. Robert’s art is about strengthening our perception to everyday images, textures and reflection, emphasizing their curious properties by singling them out and playing them off against one another. 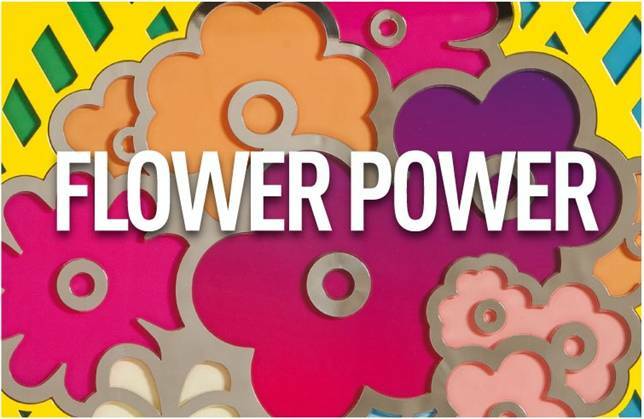 At the center of the Flower Power exhibition will be a collection of flower pieces – a kaleidoscope of arcs juxtaposed with hatched backgrounds – A melody with a rainbow of colors. Flower Power is the latest iteration of Robert Hammond’s Visual Ritual conception. Visual Ritual is about strengthening our perception to patterns, surfaces, textures and reflection – emphasizing their properties. At the core of the Visual Ritual conception is the notion of line – how they focus, lead, and drop off the eye. Robert Hammond’s work is an interface of signals, which guides and activates, it seeks to crystallize everyday our ways of seeing, by simplifying illusion, outline, movement and abstraction.